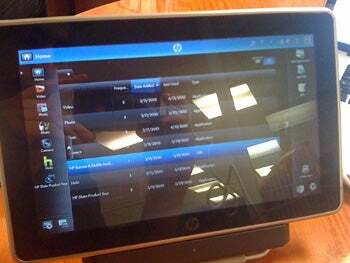 HP SLATE Reviewed - Netbook crap in tablet form, no sale! Discussion in 'iPad General Discussions' started by 4phun, Apr 20, 2010. Photo courtesy of Conecti.ca Without staged shots and carefully arranged teaser videos, the alleged Windows 7-powered HP Slate doesn't seem as glamorous in the hands-on shots from Coonecti.ca. The report, written in Spanish and translated with Google Translate, highlights some shortcomings of the Slate, such as "long and annoying" loading time for the OS. I have two HP tablet PCs 1 is being used as a desktop computer and the sylus is never ever used. And the other one has 4 gigs of ram but is used only on car trips cause it has a dvd in it and it drives me crazy because it takes so long to boot up. The Slate seems to be similiar except only the power of a netbook with one gig of RAM running Windows 7, I would have to see this work before I would buy it, but if it is not instant on like iPad it would be hard to go back to a 2 minute wakeup cycle. Love the additional features of a full computer, 5 hours of battery is enough and I'd be willing to make the trade-off for the increased feature set. As long as its 1.5 LBS and quick enough to use all of those features I'll be interested. I'll wait until its out in the wild for some "Real" reviews before making final judgement. I still have yet to see a video of anyone actually interacting with this thing....I am still highly skeptical of it. If it is so great let's see it in action! Each develops a gadget that Apple does not spare those who come after announcing that they have a replacement. Just as there are a lot of iPod Killers (still waiting) and iPhone Killers (Hello? ), now has been the range of IPAD Killers. Case to light, the HP Slate . We had a short in our hands. HP Slate is the first offering in response to the IPAD that with a straight face, wants to unseat iPodsote. Two models will be marketed HP Slate, a 32GB for $ 549 price and a 64GB and $ 599 price. Both have an 8.9-inch screen and 1024 x 600 pixels resolution powered by an Intel Atom Z530 at 1.6GHz, Intel integrated graphics chip (presumably the Broadcom Crystal HD) and 1GB of RAM is not expandable. As we saw in the Slate, has the problem that is a whole PC. If you have Office, Explorer / Chrome / Safari and all checheres that he can install Windows. You have Flash, but unfortunately this means you have a long and annoying load time operating system (and then a user-display password to enter Windows 7). If anything, it is clear that this gadget is not a competition to IPAD but the netbooks already on the market. Anyway it is worth noting the positive. The Slate has expansion ports ad-nauseum that includes a dock with HDMI and USB connections. It has a built-in camera. It has its own media management system that is to see if it be really useful but definitely nice if it is. The screen, although smaller than that of the IPAD, is a little brighter and if, obviously, is multi-touch and although it is made of plastic, feels dense and tough. The design team continues to be pretty for what is a pseudo-range of Netbooks without a keyboard. The official verdict is "meh" . We leave a gallery of images.